Nathan Clarke’s football career came full circle when he joined FC Halifax Town. The veteran centre-back was born in Halifax, growing up in Sowerby Bridge with his brother Tom, who is captain of Championship side Preston North End. And his move to The Shay sees Clarke stepping out onto the same pitch he first graced 25 years ago in a cup final win for Sowerby Bridge, in which he scored. “I came along (to Halifax) with my dad early on,” said Clarke, whose parents still live in the same house he grew up in. “I got scouted for Huddersfield at The Shay as a nine-year-old boy. “At the time Halifax didn’t have a youth set-up, which back in the day was a Centre of Excellence, which shows old I am! “After the game I got showered and changed and then came back out and saw the scout sat with my mum and dad. “I went to Huddersfield and got a season ticket there, but when they weren’t playing, I used that as a chance to come back to The Shay. “I’ve seen a lot of friends that I know from school in the crowd, which is fantastic, and what drives you to do well with it being your hometown club. “I can picture watching them when I was a kid. I mean, the stadium’s certainly changed from when I used to come. “We always used to walk in from the far side opposite the dugouts and it was all standing back then. And Clarke says he is happy to be back at The Shay. “When I first came and met the manager and walked through the tunnel, it was very strange, a little bit surreal,” he said. “But I’m really glad to be here and helping the team. “I’ve always given as much as I can for the clubs I’ve played for but coming back here, I’ve got a lot of fond memories. 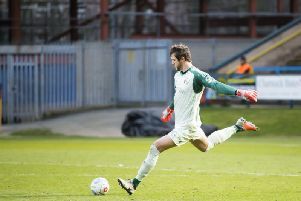 Clarke has made more than 500 appearances in a professional career that saw him spend 11 years at Huddersfield before playing for the likes of Leyton Orient, Bradford City and Coventry. “I still feel like I’m a 21-year-old!,” he said. “I feel fit and healthy. “I’ve only ever known football from being nine-years-old and signing at Huddersfield up to now. Does Clarke appreciate the game more now in the autumn of his career? “I think you do, especially having a young family as well,” he said. This is the first time Clarke has played in non-league, but he said he had no qualms about dropping out of the Football League. “None at all. I came and met the manager and got shown around the ground. “The standards in everything we do day-to-day is very high, and it’s the players and the manager that drive that. “You’re in every day so it’s pretty much what I’m used to. “The manager’s desperate to do everything as well as he can with regards to food, the training facilities, they’re all spot on. “It’s a fantastic, tough league, a lot of games, a lot of physicality probably compared to the leagues I’ve been used to, but I’m enjoying it. Clarke has been impressed with manager Jamie Fullarton. When asked for his impressions of the Town boss, he replied: “Really good, really thoughtful, really aggressive on how he wants his teams to play and making sure everybody knows their roles. “Thankfully, players are buying into that and that’s what you’ve got to do as a player. “I’ve played under a lot of managers and you’ve got to buy into how they want their team to set-up.